"God has given us people and resources. It will take hard work on our part, but we will make it. We will get out of our problems. We are determined to produce what we eat, and stop importation. We will also chase those who stole, and get them to refund." He said the country appreciates helping hands being lent by the ADB, assuring Nigerian-born Adesina, who was the immediate past Minister of Agriculture, that "we will not let you down. Your country won't disappoint you." 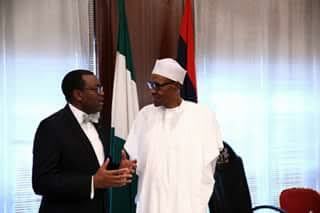 Adesina appreciated President Buhari for the support the country gave when he ran for ADB presidency, thus making him the first Nigerian to occupy such position since the bank was established in 1964. He also lauded the Nigerian President for successes recorded in securing the country, particularly in the North East, noting that "there can be no development without adequate security." The ADB boss described recent economic decisions taken in the country as "bold, tough, uncomfortable, but right," adding that Nigeria would reap the dividends in the short and long run. "You can count on the ADB as a true friend of Nigeria. You should support massive investment in infrastructure, and we are here to also support. Closing the infrastructure deficit will enable growth, and create employment. 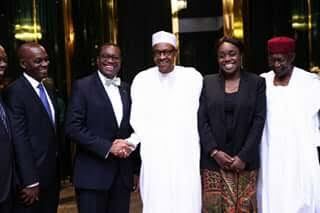 Nigeria is too big to fail," Adesina said. The ADB President unfolded the packages his institution has for Nigeria, which include; $1 billion of budget support, $300 million to create jobs for 185,000 youths, $250 million towards North East infrastructure development, $1 million grant to deal with challenges of Internally Displaced Persons (IDPs), $300 million for infrastructure development around Abuja, $200 million for Transmission Company of Nigeria (TCN) to deepen facilities, among others.